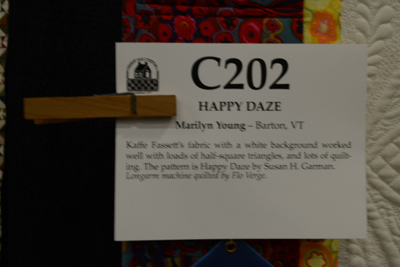 This last weekend was our annual trip to The Vermont Quilt Festival. We have only an hour and a half of travel time to get to Essex Junction from where we live. 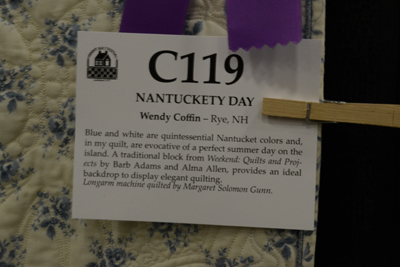 It was raining very hard and so we literally rolled up our pant legs to wade across the parking lot and wore soggy sandals throughout the show, though nothing seemed to distract us from the sights of so many beautiful quilts. Going on Sunday meant that the hours were a bit shorter and we knew time was important and didn't tarry. 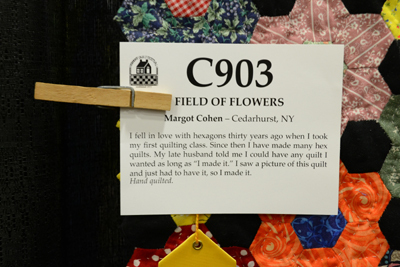 My husband carried his camera and photographed all of the "contest quilts" entered by quilters of all ranges of talents. My eldest daughter carries her camera as well, but I am content to simply take in the show! I appreciate my husband and daughter's efforts to capture the show in pictures, as it will serve as my inspiration for the next year. For me, the show is a spiritual quest to see what I can see and pay attention to what really inspires me. 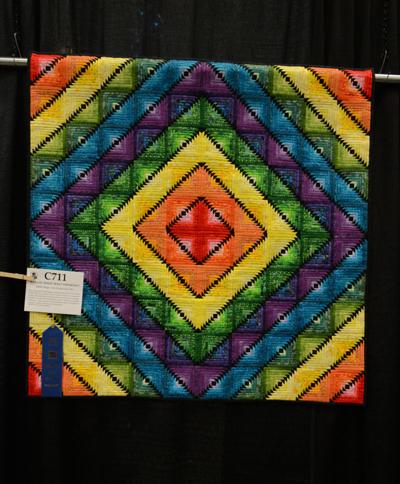 I have to go quickly to give myself time to see their antique quilt display as well as quilts done by featured quilters and still have time to shop at the many booths of special quilt vendors. Sometimes we know ahead of time what we plan to purchase, though every year, I say that I need for nothing, but it doesn't take long to know that need has nothing to do with it! I still want for much!! 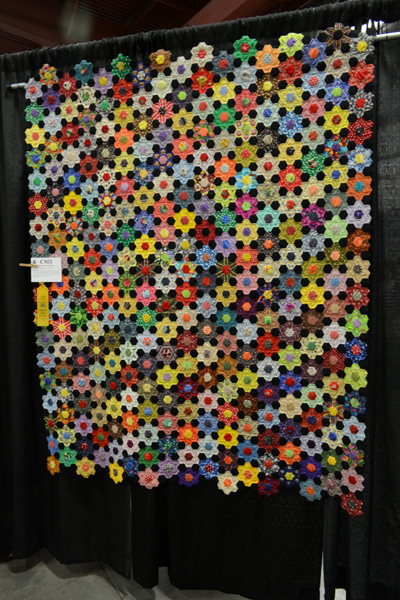 If you have never been to a quilt show, I would add it to your bucket list, and get there sooner rather than later, just in case you want to add many more in your life. 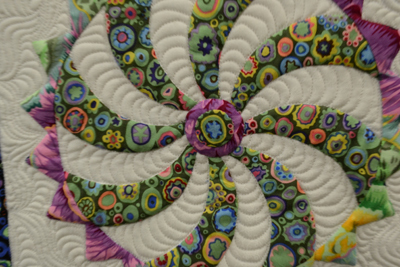 They are great fun, whether or not you sew or quilt! My youngest daughter and her boyfriend meet us there every year. They are both artists and love to come and see this great art medium, that ranges from traditional to modern, in both fabric, and design. Here are but a few photos that my husband took. 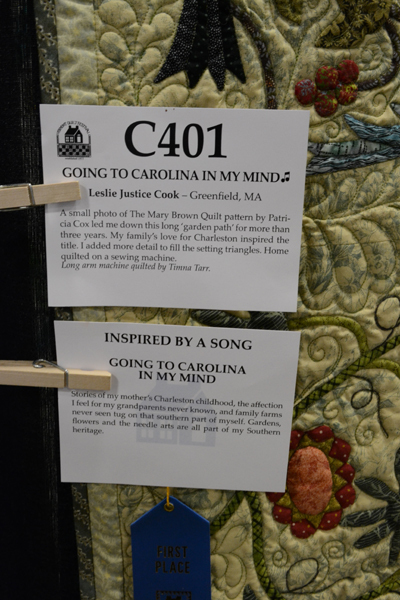 To see who made each of these special quilts see the photo below of the quilt tags. I have added their names to the captions as well to be sure that all can be read. 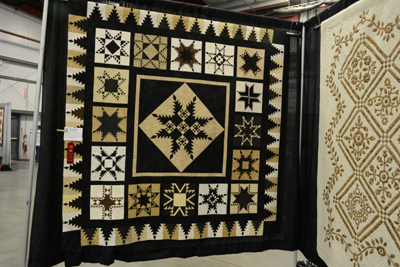 Mind you, these quilts are displayed without great lighting, and most only with black curtains in back of them to showcase them. I must say, under these conditions, my husband got some great photos! "Really? What Was I Thinking" has 3700 pieces in miniature!! 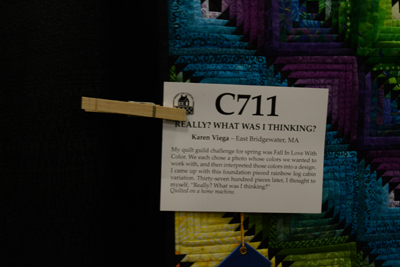 By Karen Viega of East Bridgewater, MA. by Leslie Justice Cook of Greenfield, MA. 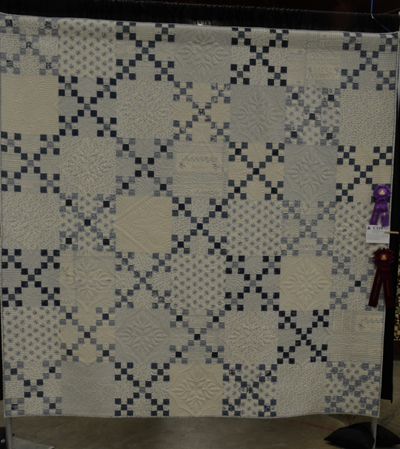 Quilted by Timna Tarr. 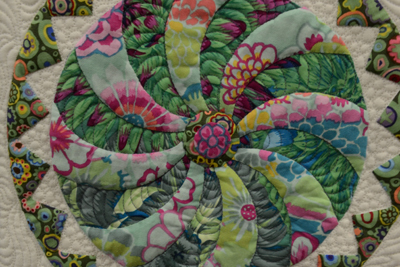 Great use of color, applique on white and tons of detailed quilting (see below). Kaffe Fassett fabrics used so well! By Marilyn Young of Barton, VT. If you look hard you can see the subtle but exquisite quilting! By Wendy Coffin of Rye, NH. 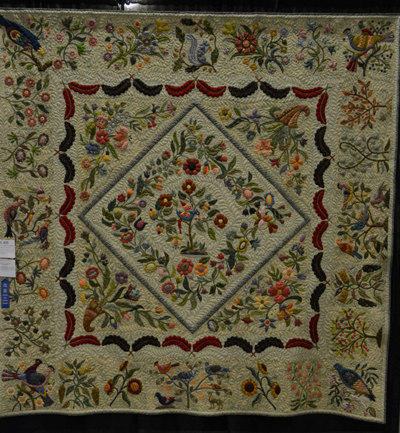 ; Quilted by Margaret Solomon Gunn. Old fashioned hexagon pattern making for great flowers!! By Margot Cohen of Cedarhurst, NY. 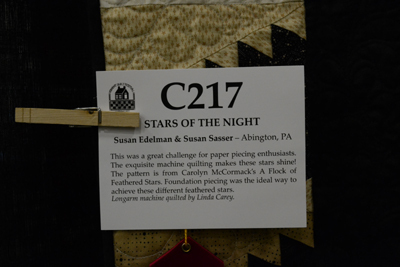 By Susan Edelman & Susan Sasser of Abington, PA.,Quilting by Linda Carey. 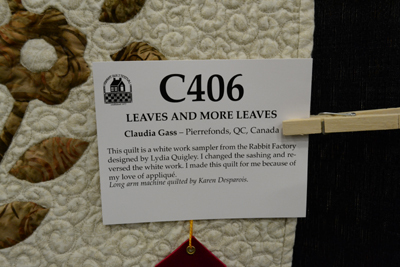 By Claudia Gass of Pierrefonds, QC, Canada. 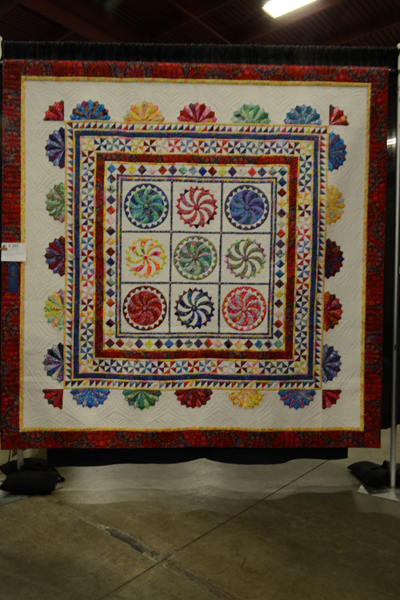 Quilted by Karen Desparois.